The Northwestern part of Southport is called Pequot Swamp. Two hundred years ago, and more, was fought here the great battle between our English forefathers and the Pequot tribes of Indians. This locality--then a lowland forest--as the scene of the Pequot massacre, was named Pequot Swamp. It is, comparatively, but a few years ago since an effectual bugbear to frighten children into obedience, was to mention them "the Indians," who-- their youthful imaginations led them to believe--were still lurking in the dark recesses of this dreaded forest. One of the "oldest inhabitants" of the village, relates to us, that he can recollect the time when the superstitious "children of a larger growth" were afraid to go near the "swamp" after dark, such was their dread of the red man. Not many years have elapsed since stone tomahawks and other relics of the Pequot’s were frequently discovered in this Indian retreat. And now at this day, when the farmer turns up its soil, flint arrow heads, such as are know to have been used by the Indians in their battles, are often found. The following account of the first white settlers in Pequot swamp is "founded on fact," although the imagination has been largely drawn upon to supply what history does not furnish. 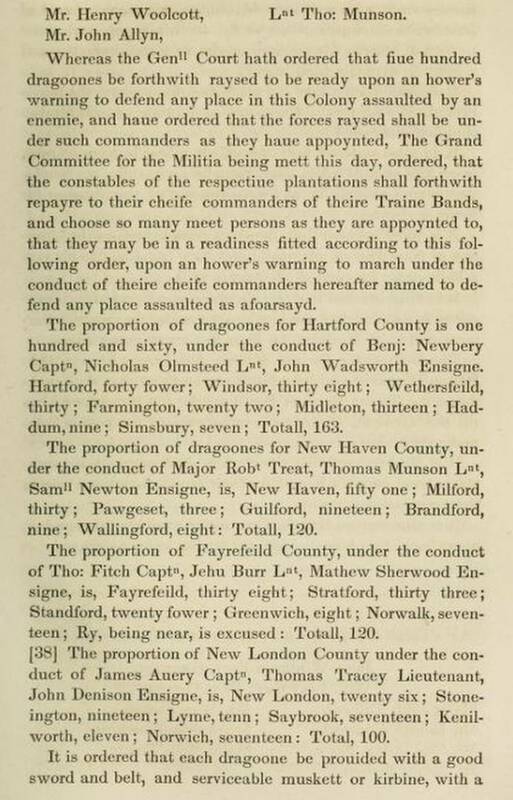 A short time previous to the battle between the English and the Pequot’s, Enoch Griswold, an exile from the Providence Colony, settled on the border of the Pequot Swamp. The house occupied by Enoch, a rude log cabin, was still standing (on the site now occupied by the Congregational church) at the beginning of the present century. Enoch's family consisted of Mary his wife, a daughter Esther, in her seventeenth year, and Josiah Morgan, a young friend and distant relative of the Griswold’s. But a few Indians lived in the vicinity of Enoch's settlements, and these were friendly. 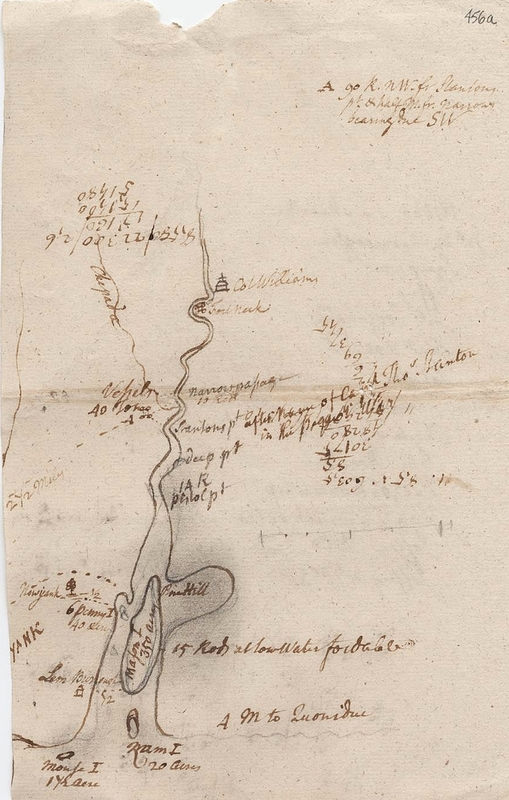 The Pequot’s were driven in here from the eastern part of the Connecticut colony, and all exterminated or carried away prisoners, except the few who escaped and were supposed to have fled and joined the Mohegan. 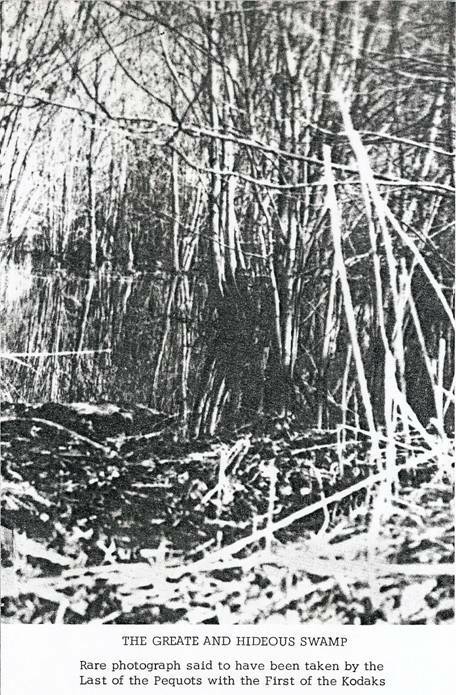 But as the sequel will appear, they returned as soon as the English had left, and secreted themselves in an almost impenetrable thicket in the swamp. They doubtless resolved there to remain, until they had avenged, in a measure, their fallen comrades, by retaliation on the white family they had noticed in the vicinity. Those were good old Puritanical, patriarchal days. Enoch and his family were happy. Their simple wants were easily supplied from the fruitful land and the bountiful sea. Often they, in company with their Indian friends, spend the day fishing, and return with well filled baskets, for our river and the Sasco were then teeming with finny beauties. It was while returning from an excursion of this kind, one afternoon that Esther, who had loitered behind the rest of the company, gathering wild flowers for a wreath, was suddenly missed. No great fears for her safety were at first entertained, as no hostile Indians were known to be within many miles, and it is a common occurrence for her to drop in at the neighboring wigwams and chat with the squaws and their children, her goodness of heart making her a general favorite. But as evening began to approach, and no Ester returned, strange foreboding filled the minds of Enoch and his household. Inquiries were made at the various wigwams, but no trace of her could be obtained. All passed a sleepless, anxious night, but as soon as morning dawned, the firm lip and dauntless eye of both Enoch and Josiah, told of their determination to ascertain if possible her whereabouts. They first retraced their steps, by the path they had come the day before, to the landing, (Now White's Rocks) near the mouth of the river, that being the usual place for hauling up their canoes; it having just occurred to them that Esther, who being accustomed to use the paddle had often taken alone might, for a little playful scare, have hidden until they were out of sight, and then returned to the boat and been carried out by a fierce squall that had arisen soon after. But their canoes were all there. A wreath was found, the tell-tale wreath to the eye of Josiah, for none but Esther could have made it. On looking further, the print of strange moccasins was discovered in the sand, an arrow was found and recognized as belonging to the Nehantics, a Long Island tribe. At the water's edge there was a mark from the prow of a much larger canoe than any at the landing. it flashed upon their minds at once that Esther had been seized and carried to Long Island by the Nehantics. Who can picture to mind the anguish of the good father as he thought of the fate of his dutiful, affectionate daughter? Who can describe the agony of Josiah, as he imagined his idol, his betrothed, in the hands of a cruel, savage, foe! A pursuit was once resolved upon. Hastily filling up their largest canoe with supplies, and accompanied by two faithful Indian allies, Wampeag and Catoonah, all were well armed, they started for the islands (now Norwalk Islands) a short distance from the mouth of the river, thinking that if their fears were true, and Esther had been abducted by that tribe, they had probably stopped their over night, and might not yet have left. Love, filial affection, and revenge nerved the ears, and they were not long in reaching the islands. As they had surmised, the Indians had stopped there; but they were now gone. The embers from a recent fire were still warm; the print of the same moccasins was visible; the prow of the same canoe had left its mark in the sand. 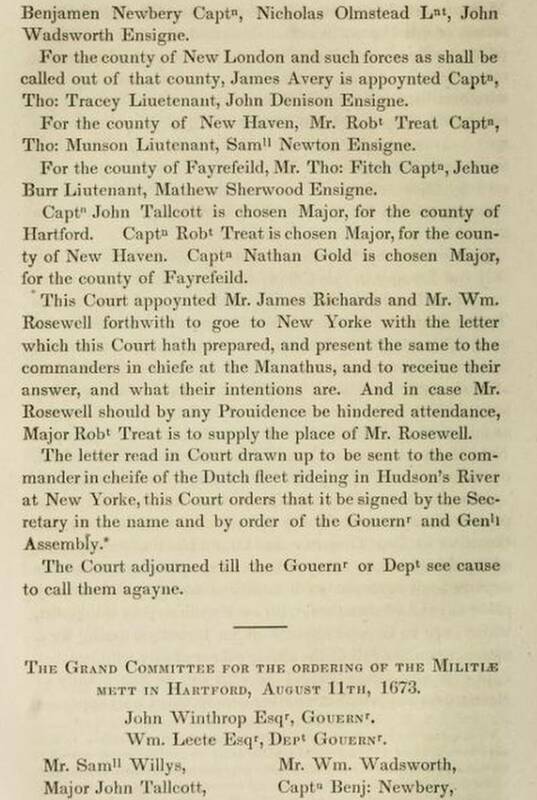 Burning with impatience and rage, and resolved to lose their lives if need be, in the attempt to save her, they started at once for Long Island, feeling sure from so many indications, that their foes were Nehantics, living near what is now known as Eaton's Neck. But to return to Esther, whom we left gathering flowers, little dreaming of danger. She had wandered from the path in quest of some rare colors with which to deck the brow of her lover, and having sufficient for her purpose, seated herself near a thick copse and finished her wreath. As she was looking with admiration upon her work, her cheeks flushed with the thought of how pleased Josiah would be, she was suddenly seized by four dusky Pequots. Before she had time to make any outcry, she was gagged, tied, and hurried into the woods. 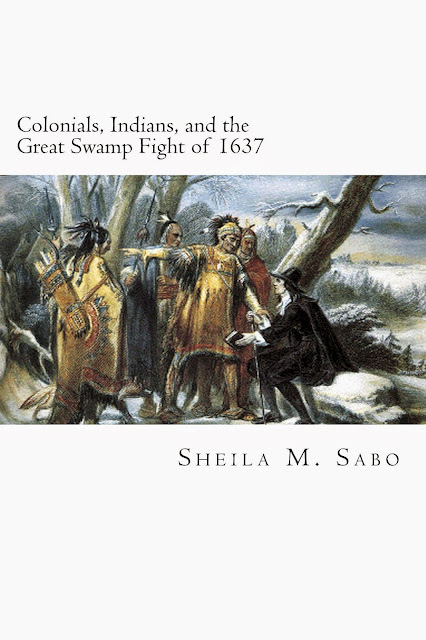 Making a wide detour through the woods, which were then continuous from Pequot Swamp to the Sasco, the Indians dragged the almost insensible Esther to a bend in the Sasco, (where now stands the dwelling of Capt. Thorp,) and there meeting two comrades in waiting with a canoe, hastily embarked and glided down the river to a dense clump of woods near itsmouth, where they waited until under cover of the darkness, they could proceed in safety. As soon as it was fairly dark they left the river, and hugging along the land, stopped at the place where Esther, a few hours before, had so happily tripped ashore. Here they purposely dropped the wreath, and the arrow which had formerly belonged to the Nehantic, and leaving plenty of traces in the sand, they started for the islands. Staying there until near midnight, and leaving fuel enogh on the fire to last till morning, they then doubled their track, and returning to Sasco River, were long before daylight, snugly ensconced in their Pequot lair; succeeding well, as we have seen, in throwing his party off trail. So intent were the pursuers on the object they had in view, so earnest in their purpose to rescue Esther, that they had hardly noticed the heavy swell of the sea noticed the heavy swell of the sea from a violent northeaster, which then, as now, was common to September. The wind blew almost a gale, and was increasing every moment. They had proceeded about half the distance fromLong Island, when Enoch, who seemed to have a presentiment of his fate, exclaimed to his companions, "we shall never reach the shore! O, my poor Esther, I shall never see you again!" Their frail bark soon after began to take in water. Still by bailing and using the utmost skills to keep her trimmed, they succeeded in getting within a mile of the shore, near the reef, when they were capsized. Enoch, with one look of despair, sank, and was not seen after. Josiah and the two Indians clung to the boat, and nearly exhausted, drifted ashore. The Nehantics, though not friendly to the tribe on this side, yet had enough of human kindness in their hearts to befriend a shipwrecked company. Josiah and his companions were tenderly cared for, and they learned from the Nehantics, without exciting their suspicions, that none of their tribe had made any voyages to the north shore within several days. Grief, the double bereavement, the loss of his beloved and of him who was a father, had well-nigh unmanned Josiah, and with a heavy heart he made preparations for returning. The next morning, the storm having subsided, they started. On their way they stopped again at the islands to see if they could discover any more traces of Esther and her captors. That her abductors had been their was plain; but the Nehantics were not the guilty party. Who could it have been? They again examined the beach. The footprints of Esther were plainly visible, for the Pequots had unbound her after reaching the islands. On looking further, where there was a spot of smooth clean sand, the tracks appeared to have a method--a design about them, and examining them closely, they could plainly make out the word "Pequot" imprinted by her feet in the sand. this gave them a clue, and yet a faint one. 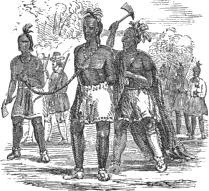 Of the history of the battles they were familiar, knowing that the Pequots were all killed or taken away prisoners, except the few that joined the Mohegans. Had some of that few returned, and with their whites captive gone back to the Mohegans? Oh, with what a feeling of loneliness and almost utter despair Josiah gazed upon that word in the sand. He could imagine how she, intently watching her masters lest they should discover her intentions, had endeavored to guide her friends in their pursuit. those dear footprints seemed to him the last of Esther. Hope of seeing her again had nearly fled. Sadly they turned the prow of their boat homeward. No Esther-no Enoch. How could Josiah break the tidings to the mother, the wife. Had they come back--this party of rescuers--bringing the darling object of their search, with what alacrity their little craft would have sped over the intervening water. But now, instead of one to them as dead, another, Enoch, the head--the chief of the little family, was gone. How languidly the canoe crept towards the landing. How they dreaded to meet the anxious bereaved one. To Mary the blow was overwhelming. To be deprived of her husband and her daughter, and she in a strange land, an exile from the home of her kindred; it was well nigh insupportable. The sympathy of the little community was aroused, and not only their sympathy, but their anger. It seemed to be the one opinion among the Indians, that Esther had been carried off to the Mohegans. The Sachem was indignant that a sneaking Pequot should dare to steal his pale faced daughter, as he regarded her. 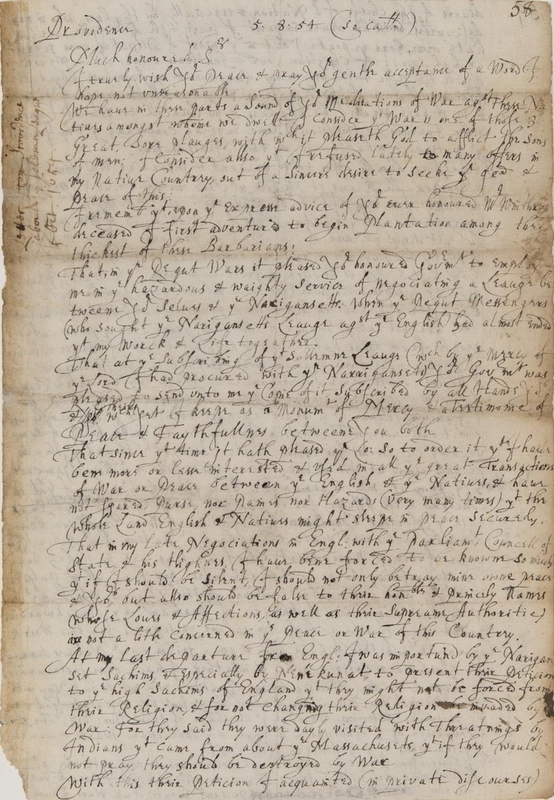 Wampeag and Catoonah offered to go in disguise to the Mohegan country, and if they found her, one of them was to return for help to assist in the rescue, and the other to remain near, to shield her, as far as possible, from harm. They started on their hazardous journey, but with little hope of success. The anguish and excitement of the last few days was too much for the not over robust Josiah. The Pequots in their secure retreat were gloating over the prospect of revenge their captive they treated kindly in their rude way, not being ready to take her life--the final satiation of their hate. They knew the value of their prize, for, unperceived, they had often been near the dwelling of Enoch, before the capture of Esther, and knew the high esteem in which she was held. The torturing--the death of one such pale face, was to them an equivalent to the torturing and death of scores of red men. During the day they did not venture far from their hiding place, except to fish on the thickly wooded banks of the Sasco. They avoided the friendly Indians, and if seen, being dressed like them, they escaped detection. At night, leaving one or two in charge of their prisoner, the others would travel miles away to gather clams, oysters, and other food. Esther had become almost a stoic. Sorrow had benumbed her faculties. She did not dread death; to her it would be a relief. The past happy life was like a dream. The few weeks that she had been imprisoned seemed an age. Where she was she knew not. The islands to which she was taken immediately after her capture, she was familiar with, having often visited them with her parents and Josiah; but before they returned, the Pequots had blindfolded her. She little thought that not a mile intervened between her and her home. Three months rolled by. The two Indians had come back, but brought no tidings of Esther. They found that the remnant of the Pequots had not joined the Mohegan Tribe. Josiah had recovered in some degree his wonted strength, but the fire of his manhood was gone; the light of his life had, to him, been put out. Sometimes he would fish or hunt with his Indian friends, but these sports had lost much of their zest. Twice, lately, on the banks of the Sasco, after a light snow, they had noticed tracks of a moccasin similar to those seen in the sand, at the landing, the morning after her abduction. They appeared to proceed from and go towards the dense thick in the swamp. This copse had never been entered since the battle. It was the most difficult of access, and a sort of supernatural dread seemed to affect the minds of the Griswold family and the Indians regard to it; and no wonder, for around it lay bleaching the bones of many a Pequot. The more Josiah thought of the similarity of the tracks in the snow and those in the sand, the more he felt convinced that they were made by the same feet. All at once it occurred to him that Esther was in that thicket. So sudden was the thought that his brain fairly reeled with excitement. As soon as he became more calm, he resolved to immediately explore this part of the swamp, and hastily told a few trusty Indians of his plans. Knowing well that if the Pequots were there, they would naturally leave at night, or most of them, for their food, as soon as it was dark, Josiah and his friends stealthily approached the thicket on the side toward Sasco river, until they were as near as possible without being discovered. They had not long to wait, when five Pequots passed out, so near as almost to touch them in their place of concealment. Waiting until they had gone far beyond hearing, Josiah, with feelings excited to an intense degree, led the way in the direction the Pequots had just come. With a panther like tread, they slowly entered the tangled passage. those minutes were hours! Soon, a light in the far end of the opening guided their footsteps! Two figures could be plainly seen! It needed iron nerves just then! A few more steps, half walking, half creeping, and Josiah had the swooning Ester clasped in his arms! Her guard, asleep, was quickly dispatched by Josiah's comrades. Loosing her bonds, they at once made their way out. Leaving the Indians to watch for the Pequots, who, returning towards morning, were riddled with bullets, Josiah and Esther, with feelings too happy for utterance, returned to their home, to meet with still another joy; the father--the good Enoch was there! Was it truly him, or his spirit from the dead! When the canoe upset, the box containing their supplies had drifted near the spot where he arose, and clinging to it, he had been carried by the current some miles below the Neck, and had been picked up, more dead than alive, by a tribe just starting for the Hudson. He had finally escaped from them, and after many adventures, had returned just in time to make the happiness of that family complete. 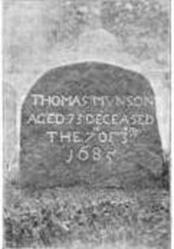 The lone settlers were soon made glad by an accession to their number, several more families emigrating from the Providence colony. Josiah and Esther were married a few months after, and some of their honored descendants are now living in our midst. Enoch and Mary lived to a good old age, happy in their declining years, in having such a son and such a daughter. To the Righte worshipfull the Comissionrs of the United Colonyes at Massathusetts wth trust present. 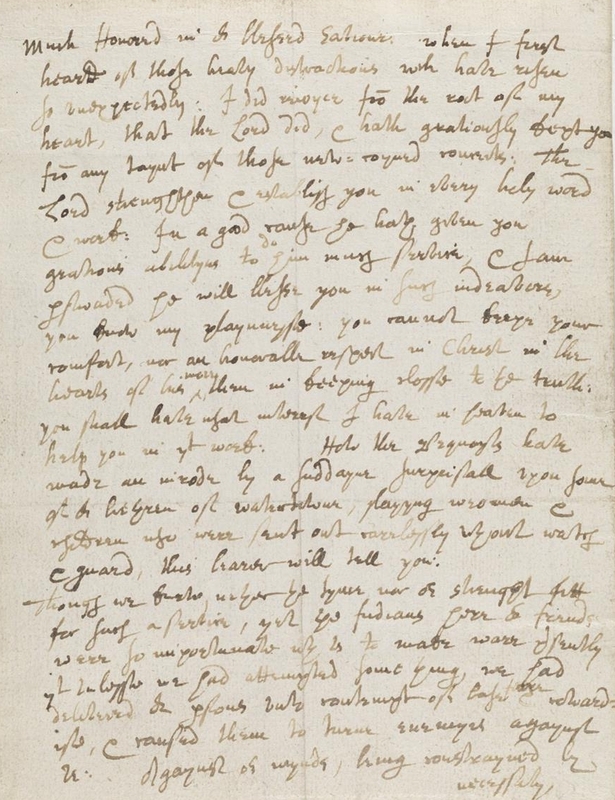 I thought good being desired by Oncos to prsent Somethings to yor consideracon shortly after hee was wounded by Cuttaquin I being at Monheag sent for the men that sayled in the Bark wherin he was hurt and Did then examine Cuttaquine before them Wm. Lord alsoe being he then confessed that hee had wounded Oncos wth a Sword and that he had beene hired to Doe it two yeares since, by Webetomauge Nynicunnett Pessicus and meeksaw, and was to have for his paynes 1000 fathom of wampom of wch he had already recd two hundred he alsoe said that hee was frequently urged by them to Doe the thing especially Seaven dayes before the fact, I alsoe asked by one Valentine whoe is a good Indian interpreter how he Durst attempt Such a thing soe neare monheag sd he Said was necessitated for eyther he must kill Oncos or be kild himselfe he alsoe then confessed that he had received two hundred fathem of wampon already and that he had played away ten fathome at one time and the foresd Sachems payd it for him hee alsoe confessed the same voluntary at Hartford before me Will Ruscoe being present that he was hyred by the foresd Sachems to kill Oncos & Oncos Still complaynes of his being Deprived of his men whoe lived Nameag ten or twelve of them being harboured at fishers Island the reſs are wth Nynicunnett: and that Severall of his men being lately at Mr. Winthrops weare threatened in his presence by his servant Jno. Auſtin that if any of the Monheags came to fishers Island he would kill them, and alsoe that he would come to Monheag and shoote them there. 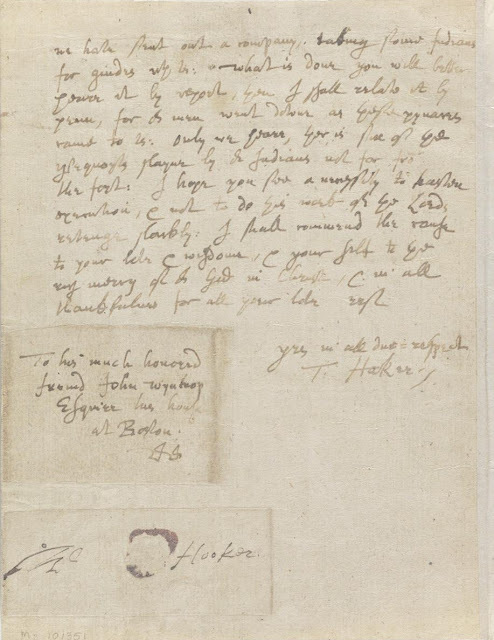 hee is much trobled that those that should be helpfull to him are now held and maynteined to be his greatest professed enemies may it please yor worships at yor last sitting at Plymouth I acquainted you that Wequashcook Declyned the Nannogansett and protested agst their plotting and that hee Desired the favor of the English provided hee weare inocent he hath hitherto kept at a Distance wth them haveing combyned wth Oncos, he Desireth that you would please to take his case into consideration: he sayth and indeed I have been enformed severall times that he is a Sachem as great as any at Nannogansett but they have usurped and Tiranized over him meerely because hee Did somewt favor Oncos forceing him to fight with Oncos agt his will telling him if hee would not goe wth them to fighte they would cutt of him and his and that the Sachems of Nayantuck have forcibly Deprived him of his prop rights Driveing him out of his native countrey takeing from him not only the ground but wth all the privledges that Did proply belong to his father and himself, haveing noe other place he is constrayned to live in a parte of Pequott countrey neare adjoyneing Notwthstanding he heareth that the Nannogansett would put him to pay two hundred of wampom as parte of the 2000 Due by covenant he doth ernestly Desire that his condicion may be weighed by your worships hee alsoe sayth that Robbin Servant to Mr. Winthrop threaten him that his Mr. shall there build and keepe Cowes and so force him from thence alsoe, Oncos Doth alsoe complayne that the English of Nameag hath forbid and will at noe time pmitt him to fish in Pequot (Thames) River, and he hath had two Cannoes about tenne weekes since being ceazed the one halfe way to monheag taken from him by Robt Bradle, and forceibly Kept the other ceazed about three miles from Nameag taken by a short man as he Describes him of Nameag and is alsoe Deteyned to this present; I shall alsoe adventure to acquaint yor worships concerneing Some other passages shortly after the Nannogansett strange attempt and plotting the last yeare Mr. Winthrop wrott to me for approbacon that Nymcunnet might hunt in Pequot countrey. 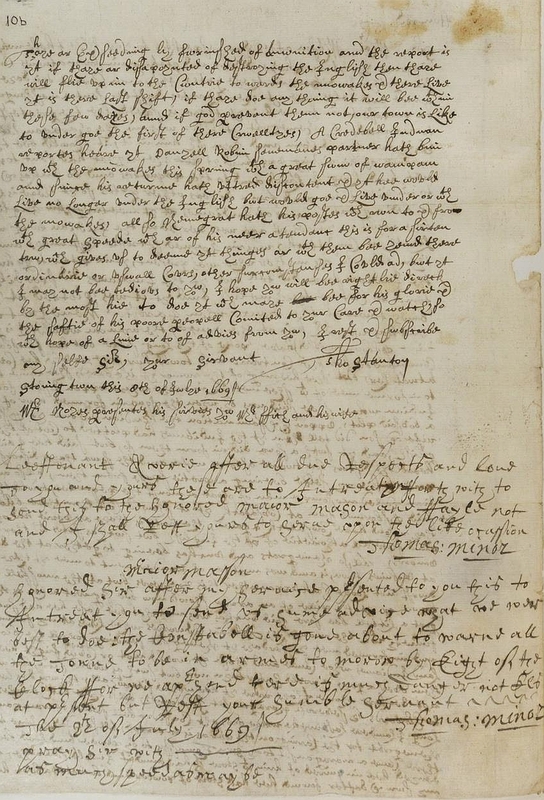 I utterly Disallowed of such a course and protested agt, it as farre as it any way cocerned me and wth all acquainted Mr Wintrhop that I thought would be very Displeasing to the English considering theire late insolencies and the present condicion in wch they weare, under breach of Covenant wth the Comissionrs. 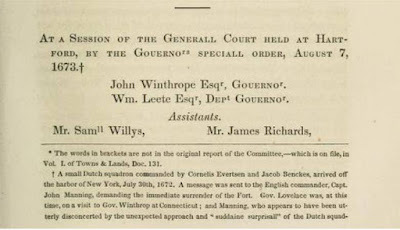 Shortly after he wrott to Mr Haynes whoe was then at Seabrooke to that purpose and recd the like answer not long after I was enformed that Mr. Winthrops Servant as he is caled possessed and gave out that by his Masters allowance the Nannogansett had liberty to hunt Pequot countrey often being enformed that they weare resolved alsoe to Doe accordingly where upon Mr. Haynes wth my selfe acquainted the Court at Hartford whoe being Some what affected wth it, that it should be Soe acted by those Nannogansetts considering the present state of things: I had then liberty to endevor to prevent theyr intended purpose, and soe my Selfe for I must confess I was much trobled about it went to Monheag to that end heereing the Nannogansett weare sodaynly to hunt. 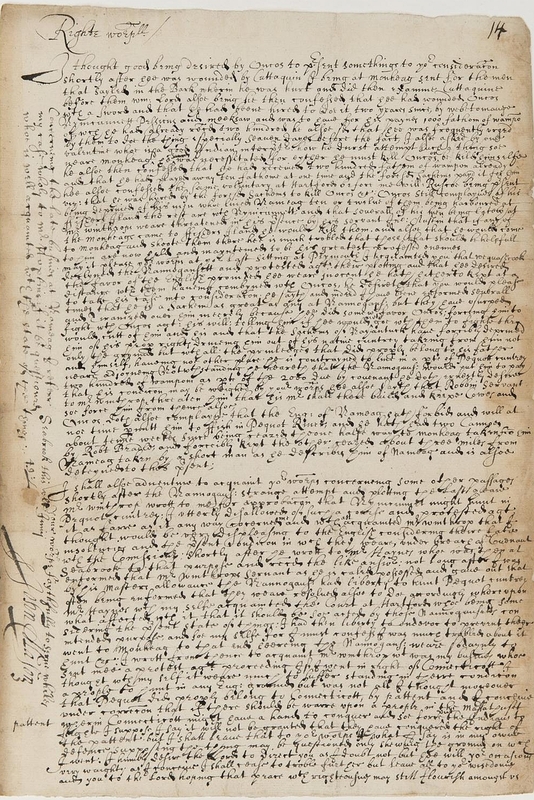 I wrott from thence to acquaint Mr. Winthrop wt was my busines whoe Sent mee a protest agst proceeding If I went in right of Connecticott I thought wth my self it weare much to suffer standing in theire condicon a people to hunt in any English ground but was not all I thought morevoer that Pequot Did proply belong to Connecticott, by pattent and I conceive under correcon that if there should be warre upon a people in the Massathuset pattent wherin Connecticott might have a hand to conquer and soe force put the Indians to flighte I suppose I say it will not be granted that they have conquered the right of the pattent but I shall leave that to yor worships I what I say is in my owne Defence supposing the thing may be questioned only shewing the ground on wch I went: I humbly Desire the Lord to Direct you as I Doubt not but hee will yor occasions very waighty as I conceive I shall cease to troble further but leave all to yor wisedomes and you to the Lord hoping that peace wth righteousnes may still flourish amongst us. After due respecktes to your selfe these maye informe you yt wee have Divers and strang informationes Consirning the Indianes in these ᵱrts, Harman Garrat this daye Came to mee and teles mee yt Nenegrates dasserter sent a messenger on purpose to in forme him yt there is speedylye the greatest dans to bee made by Nenegrat yt ever was in the Naragansset and yt if hee would Com and Joyn wth him in it, it should bee the meanes of his rising upp, and yt hee Nenegrat had sent to Nip net and Long IsLand and to the pequates and to Unkas & his to invite them and from Divers other ᵱartes so yt there is Like to bee a great concors of Indianes at yt meeting, An English boye about 12 yeeres of age well verſed in the Indian tung wc he Liveth at Cowsattack, was in Joyned secrelie last maye and then bid tell his mother whoe was present, yt in pittie to yu hur the Indian squa did tell hur yt the Indianes did speedilyie in tend to Cutt off the Englysh and yt it was plotted at Robines town at the dance when I arested Nenegrat when Unckas was wth him at the dance, the woman would (yt is good wife Osborn would) have spoke of this Long since but hur husband Comananded hur the Contrarie and tould hur shee would bee Counted, but shee heering of the rumor yt is abroad, shee came to mee to informe mee of wt shee met wth in maye where uppon I sent for an Indian whom shee said was by when the squa in formed hur of the a boy said plot, uppon Examination the Indian did owne yt Osbornes wife & son did tell them yt the Indianes had plotted to Cutt of the English, and yt such a squa did in form them so, but said hee I did not heare the discors beetwene Osborns wife and the squa thaye discorſsng privatlie my selfe beeing a pretie spase from them, allso an Indian called mosomp, a man of Noat amongst the pequates, tould this a boy said Osbornes son at Cowsatock yt it should Cost them there blloods but thay would have Cowsatock agaien, the truth is thaye are verie hie of Late and slite all athorietie of the Inglish but such as lutes wth ther own rumores, Allso Nenegrats and Unckas beeing together at the dans at Robinestown, is and was matter of wonderment to mee yt thaye woe durst not Looke Each uppon other this 20 yeeres but at the muzzell of a gunn or at the pille of an arrow should now bee so great when as Nenegrat a Littell beefore said Unckas was matchet bee Case hee had such afffiniety wth mowakes, Thomas Edwardes whoe Lives at my farme Came and informed mee yesterdaye yt Nenegrat sending for all the block IsLand Indianes whoe Came and those yt would not or Could not fight hee sent them over a daye & would Entertayn non but such as would fite, but would not Declare whome thaye were yt hee would fite wthall, this was declared to Edwards by severall Naraganset Indianes, allso there hath bin severall Long IsLanders Last weeke whoe brought Considrabell sumes of wampam to Nenegrat for the Caring on the war as is reported, allso 2 dayes since there there Came a naraganset to my sln Thomasses to by powder and Lead beeing denyed hee inquired of him wt store I had, and if I would ſell anye, but my son & after found hee had store of powder and bulletes about him Thaye are Exceedingly furnished of amunition and the report is yt if thaye ar disapoynted of destroying the Inglish then thaye will flie up in to the Cuntrie towards the mowakes & there Live yt is there Last shift, if thaye doe any thing it will bee wthin these few dayes, and if god prevent them not, our town is Like to under goe the first of there Cruelltyes, A Credebell Indian reportes heare yt Danyell Robin Sonemanes partner hath bin up wth the mōwakes this spring wth a great sum of wampam and since his returne hath uttred discontent & yt hee would Live no Longer under the English but would goe & Live under or wth the mowakes, allso Nenegrat hath his postes wch run to & from wth great Speede wch are of his neer atendanc this is for a certen tru, wch gives us to deeme yt thinges ar wth them bee yond there ordinarie or usuall Cours, other surcumstances I Could ad, but yt I may not bee tedious to you. I hope you will bee rightlie direct by the most hie to doe yt wch maye bee for his glorie & the saftie of his poore peopell Comited to your Care & watch, so wth hope of a Line or to of Advies from you. 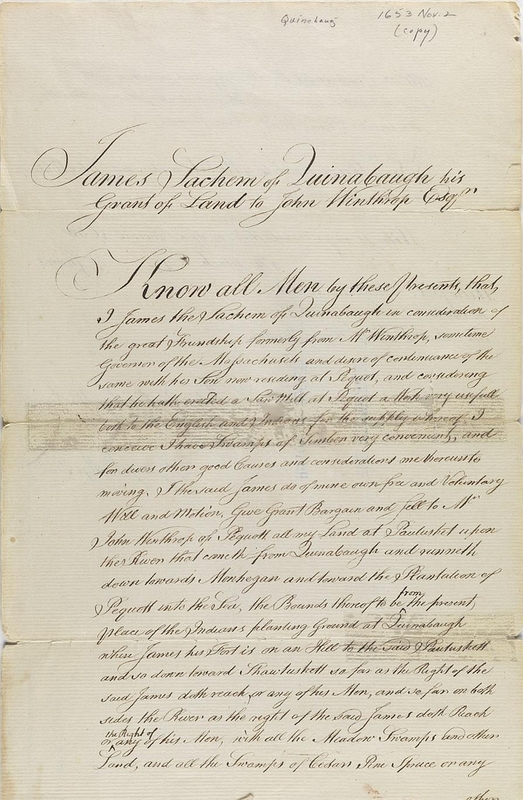 James Sachem of Quinabaugh his Grant of Land to John Winthrop Esqr. Know all Men by these Presents that I James the Sachem of Quinabaugh in consideration of the great Friendship formerly from Mr. Winthrop, sometime Governor of the Massachusets and desire of continuance of the same with his Son now residing at Pequot, and considering that he hath erected a Saw Mill at Pequot a Work very useful both to the English and Indians for the supply whereof, I conceive I have Swamps of Timber very convenient, and for divers other Causes and considerations me thereunto moving. 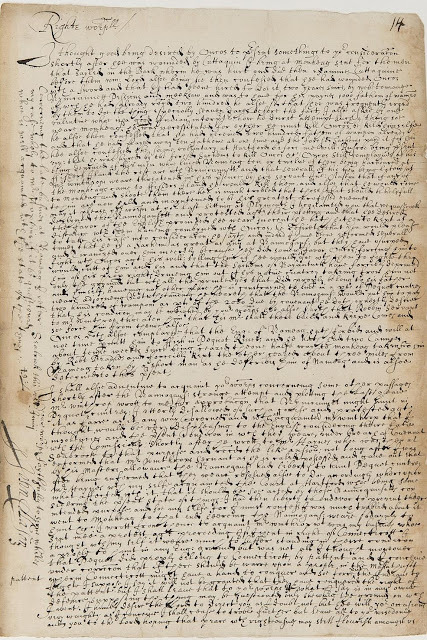 I the said James do of mine own free and Voluntary Will and Motion, Give Grant Bargain and Sell to Mr John Winthrop of Pequott at my land at Pautusket upon the River that cometh from Quinabaugh and runneth down towards Monhegan and toward the Plantation of Pequott into the Sea, the Bounds thereof to be from the present place of the Indians planting Grounds at Quinabaugh where James his Fort is on an Hill to the said Pautuskett and so down toward Shawtuskett so far as the Right of the said James doth reach, or any of his Men, and so far on both sides of the River as the right of the said James doth Reach of ˄ the Right of any of his Men, with all the Meadow Swamps and other Land , and all the Swamps of Cedar Pine Spruce or any other Timber fit for Sawing and all other Timber and Wood whatsoever together with the Place where the Marcasite Stones that Moas found. 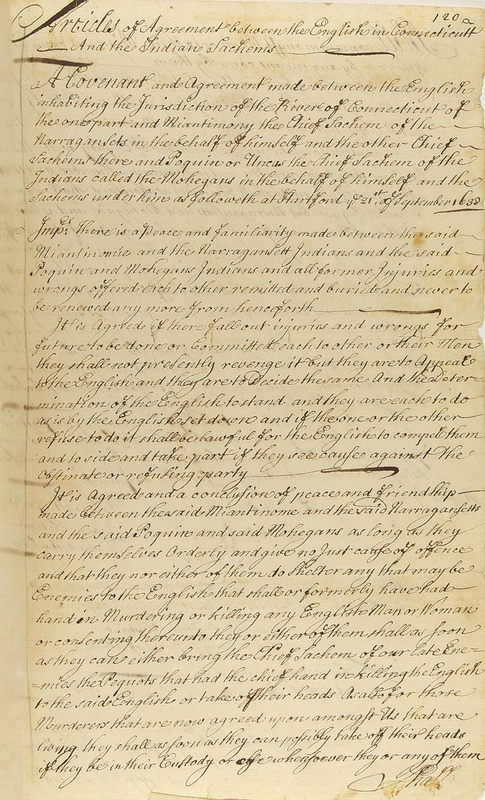 A Covenant and Agreement Made between the English inhabiting the Jurisdiction of the River of Connecticut of the one part and Miantimony the Cheif Sachem of the Narragansets in the behalf of himself and the other Chief Sachems there and Poquin or Uncas the Chief Sachem of the Indians called the Mohegans in the behalf of himself and the Sachems under him as followeth at Hartford ye 21st September 1638. 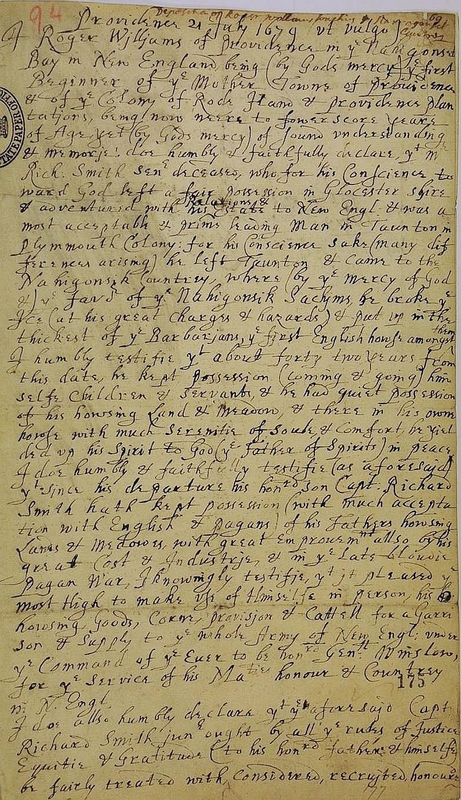 There is a Peace and familiarity made between the said Miantinomie and the Narragansett Indians and the said Poquin and Mohegans Indians and all former Injuries and wrongs offered each to other remitted and buried and never to be renewed any more from henceforth – It is Agreed if there fall out injuries and wrongs for future to be done or Committed each to other or their Men they shall not preſently revenge it but they are to Appeal to the English and they are to Decide the same And the Determination of the English to stand and they are each to do as is by the English set down and if the one or the other refuse to do it shall be lawful for the English to compel them and to side and take part if they see cause against the Obstinate or refusing party. 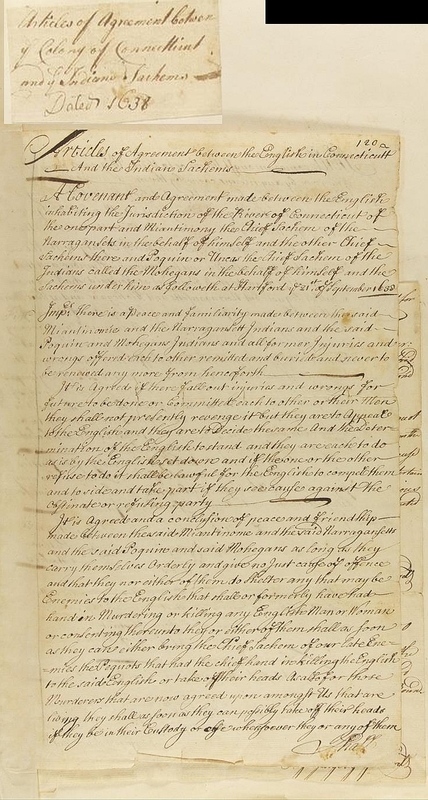 It is Agreed and a conclusion of peace and friendship made between the said Miantinome and the said Narragansetts and the said Poquin and said Mohegans as long as they carry themselves Orderly and give no Just cause of offense and that they nor either of them do Shelter any that may be Enemies to the English that shall or formerly have had hand in Murdering or killing any English Man or Woman or consenting thereunto they or either of them shall as soon as they can either bring the Chief Sachem of our late Enemies the Pequots that had the chief hand in killing the English to the said English or take off their heads As alſo for those Murderers that are now agreed upon amongst us that are living they shall as soon as they can possibly take off their heads if they be in their Custody or elsse whersoever they or any of them Shall come amongst them or to their Wigwams or any where if they can by any means come to them. And whereas therebe or is Reported for to be said Narragansetts and Mohegans 200 Pequots living that are Men besides Squaws and Papoſes The English do give unto Miantinome and the Narraganſetts to make up the Number of Eighty with the Eleaven they have already and to Poquin his Number and that after they the Pequots shall be divided as aforeſaid shall no more be called Pequots but Narragansetts and Mohegans and as their Men or either of them are to Pay for every Sannop One fathom of Wampampeag and for every Youth half so much and for every Sannop Papose one hand to be paid at shilling time of Corn at Connecticutt Yearly and shall not Suffer them for to live in the Country that was formerly theirs but now is the English by Conquest neither shall the Narragansets nor Mohegans possess any part of the Pequot Country without leave from the English And it is always expected that the English Captives are forthwith to be delivered to the English such as belong to Connecticutt to the Sachems there and such as belong to the Massachusets. The said Agreements are to be kept inviolably by the Parties abovesaid and if any make breach of them The other Two may Joyn and make Warr upon such as shall break the same unless Satisfaction be made being reasonably required. 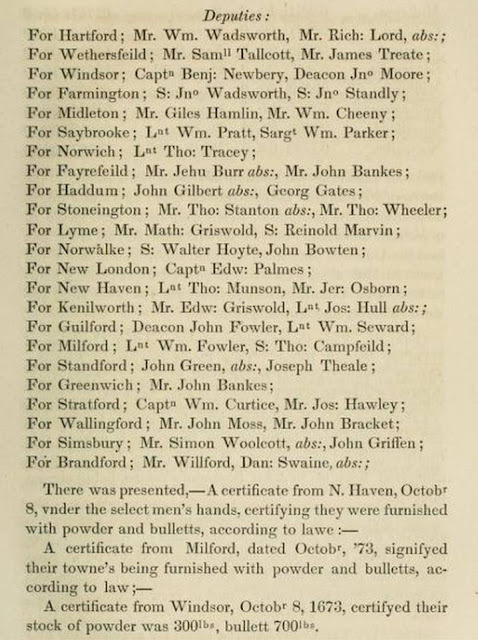 Sr . My humble, & hearty respects presented with humble, & hearty desires of your present, & eternall felicitie: Haveing heard of a late confederacy amongst great numbers of those Barbarians to assist Pumham &c. I thought it my duty to wait upon your Honor : with these humble salutacons, & apprecacons of the safety of your person, not to be easily hazarded amongst such a Barbarous scum, & offscouring of mankinde. 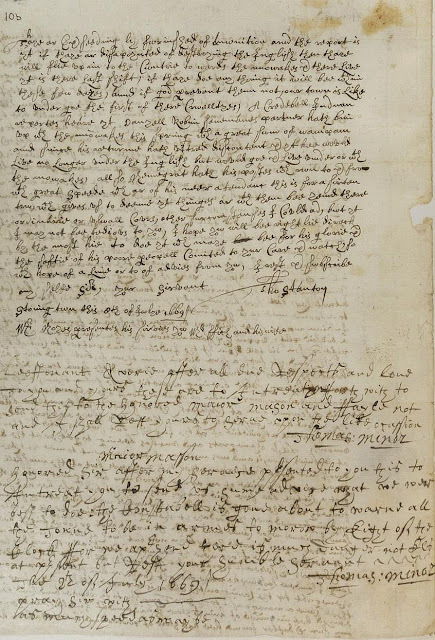 Besides, Sr . this is an old ulcerous busines, wherein I have been many yeares ingaged, & have (in the behalf of my loveing friends of Warwicke) pleaded & this cause, with the whole Generall Court of the Massachusets Magistrates, & Deputies; and prevailed with them to yeild, that if I, & Pumham could agree, they would ratifie our agreement: But Pumham would not part with that Neck, on any termes. I crave leave to add (for the excuse of this boldness) that the Natives in this Bay doe (by my promise to them, at my first breaking of the ice amongst them) expect my endeavors of preserving the publike peace, which it hath pleased God, mercifully to help me to doe many times (with my great hazard, & charge) when all the Colonies & the Massachusets, in especiall, have meditated, prepared, & been (some times many hundreds) upon the march for warr against the Natives in this Colony: Of this my promise, & duty, & constant practise, mine owne heart, & conscience before God; as also some Natives put me in mind at present. 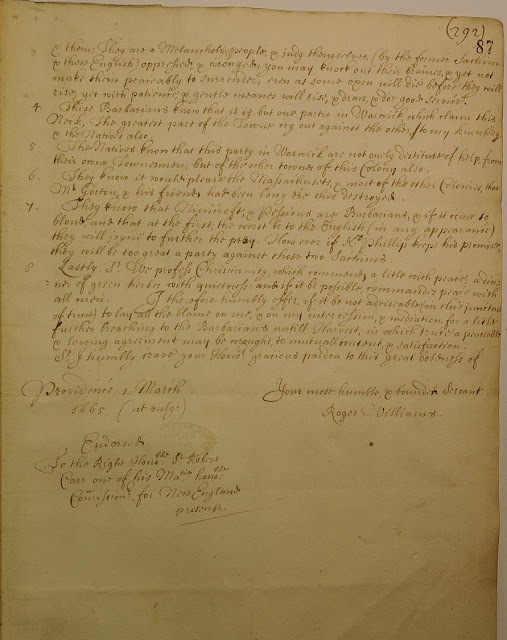 1. first then (although I know an other claime laid to this land, Yet) Pumham being the ancient possessor of this Lordship, I humbly querie, whether it be just to dispossess him (not only without consent, which feare may extort, but without some satisfying consideration.) 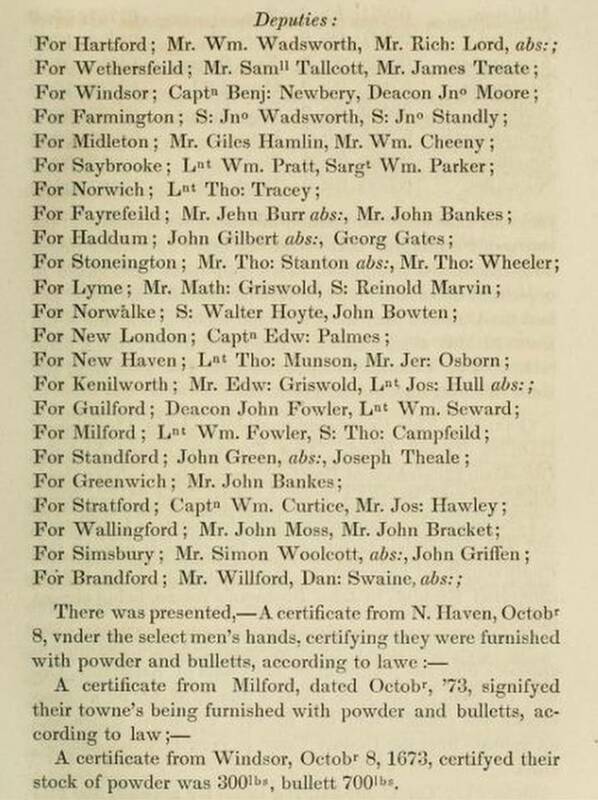 I had a Commission from my friends of Warwicke to promise a good round value, and I know some of them have desired the Natives I though it cost them some hundreds of Pounds. 2. 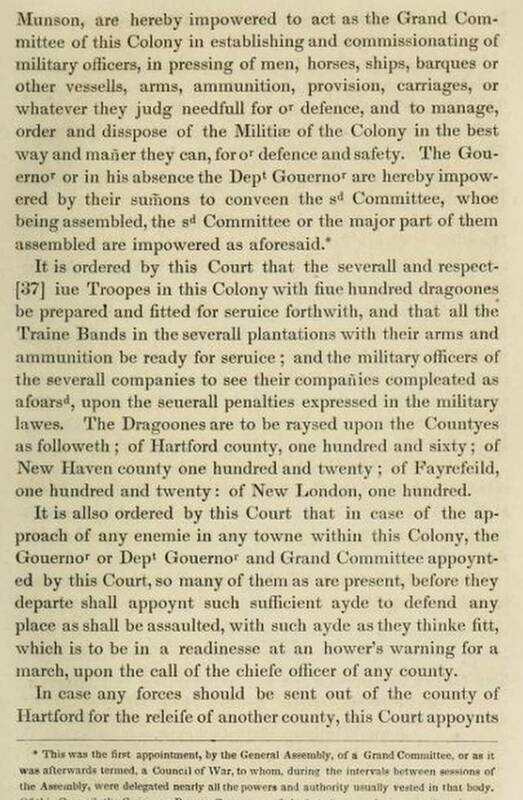 Your Honor will never effect by force a safe, & lasting conclusion, untill you first have reduced the Massachusets to the obedience of his Matie and then these appendants (towed at their stern) will easily (and not before) wind about also. 3.The business as circumstantiated will not be effected without bloudshed: barbarians are Barbarians. There be old grudges betwixt our country men of Warwick, and& them. They are a Melancholy people, & judge themselves, (By the former Sachim & these English) oppressed, & wronged: you may knock out their braines, & yet not make them peaceably to surrender; even as some oxen will die before they will rise; yet with patience, & gentle meanes will rise, & draw, & doe good service. 4. 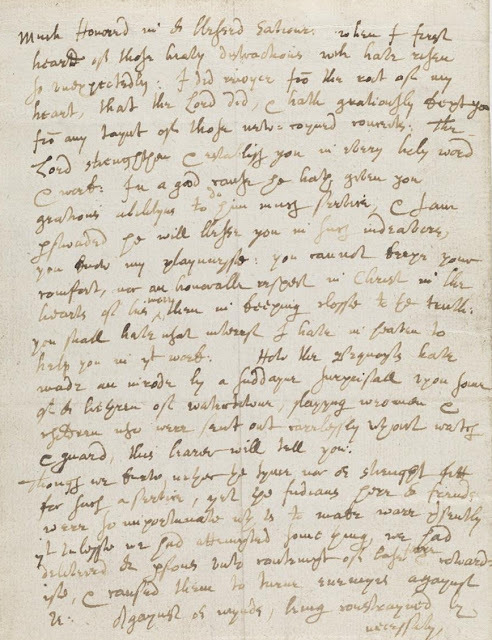 These Barbarians know that it is but one partie in Warwick, which claim this Neck, The greatest part of the Towne cry out against the other, to my knowledg & the Natives also. 5. 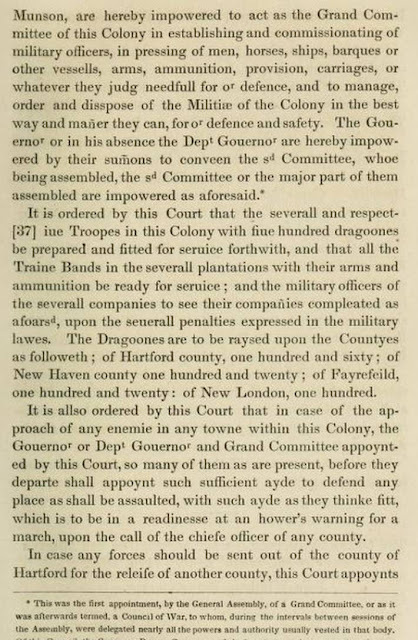 The Natives know that this party in Warwick are not only destitute of help, from their owne Townesmen, but of the other townes of this Colony also. 6. They know it would please the Massachusets, & most of the other Colonies, that Mr . Gorton, & his friends had been long ere this destroyed. 7. They know that Ninicroft, & Pessicus are Barbarians, & if it come to blows, and that at the first, the worst be to the English (in my appearance) they will joyne to further the prey: However if King Phillip keepe his promise, they will be too great a party against those two Sachims. 8. Lastly Sir, We prosess Christianity, which commends a litle with Peace: a dinner of green herbes with quietness: and if it be possible, commandes peace with all men. 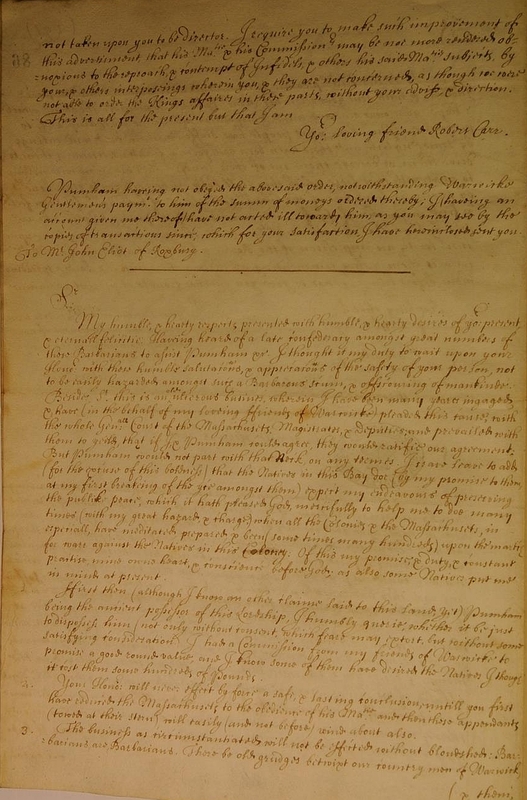 I therefore humbly offer, if it be not adviseable (in this juncture of time) to lay all the blame on me, & on my intercession, & mediation, for a litle further breathing to the Barbarians until Harvest, in which tence a peaceable & loveing agreement may be wrought, to mutuall content, & satisfaction. Sr . I humbly crave your Honors. 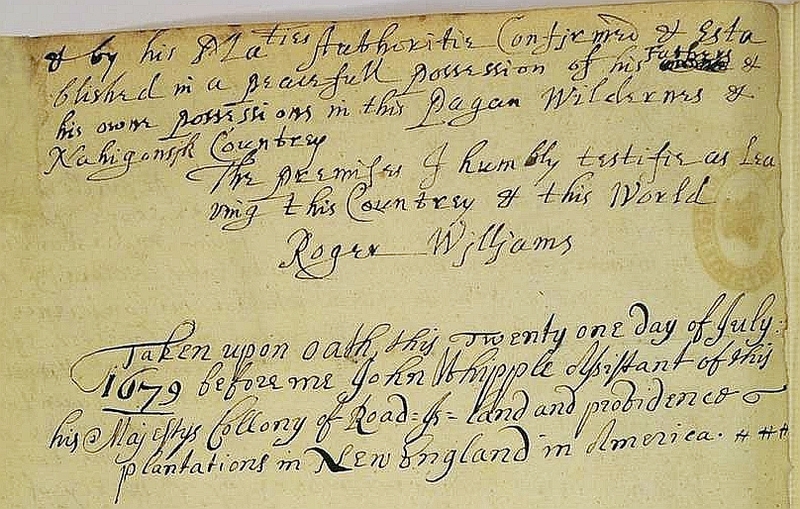 gracious pardon to this great boldneſs of Your most humble, & bounden Servant Roger Williams. Providence 1. 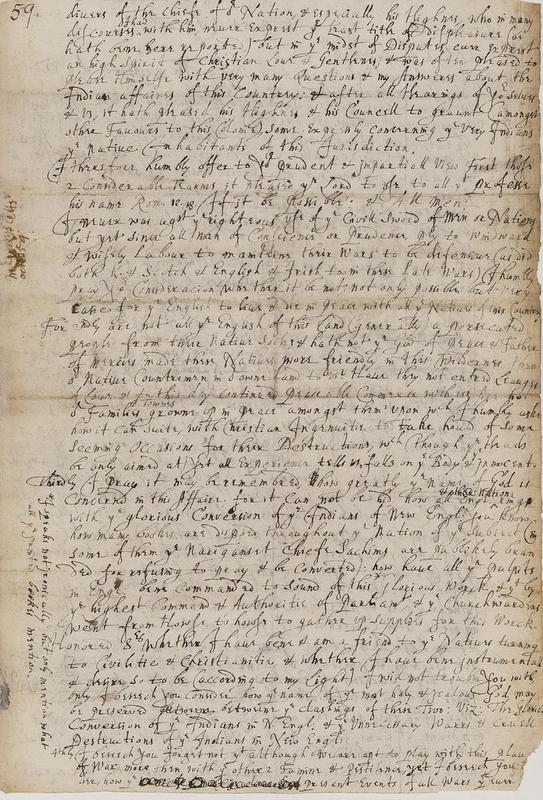 March 1665. The premises I humbly testifie as Leaving this Countrey & this World Roger Williams Taken upon oath, this Twenty one day of July,1679 before me John Whipple Assistant of this his Majestys Collony of Rhode Island and providence plantations in New England in America. To the General Court of Massachusetts Bay. Much honored Sirs, — I truly wish you peace, and pray your gentle acceptance of a word, I hope not unreasonable. We have in these parts a found of your meditations of war against these natives, amongst whom we dwell. I confider that war is one of those three great, fore plagues, with which it pleaseth God to affect the sons of men. I confider, also, that I refused, lately, many offers in my native country, out of a sincere desire to seek the good and peace of this. 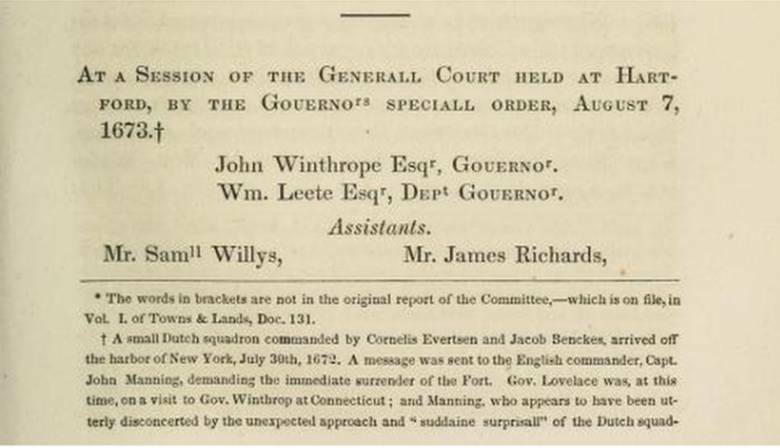 I remember, that upon the express advice of your ever honored Mr. Winthrop, deceased, I first adventured to begin a plantation among the thickest of these barbarians. 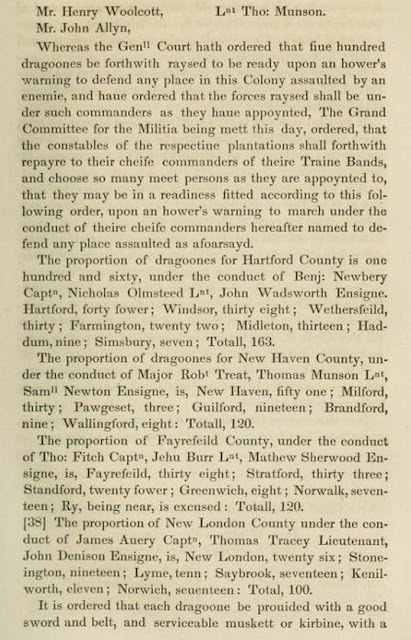 That in the Pequot wars, it pleased your honored government to employ me in the hazardous and weighty service of negotiating a league between yourselves and the Narragansetts, when the Pequot messengers, who fought the Narragansetts' league against the English, had almost ended that my work and life together. 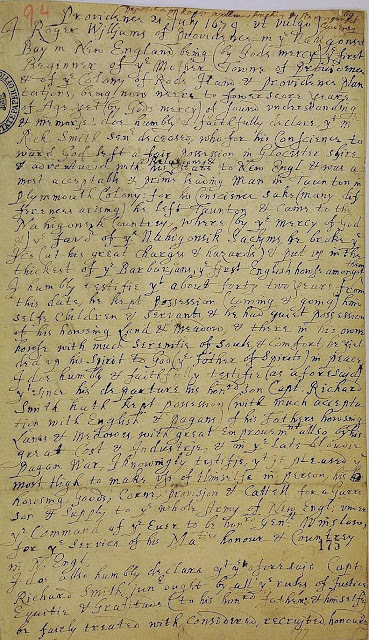 That, since that time, it hath pleased the Lord so to order it, that I have been more or less interested and used in all your great transactions of war or peace, between the English and the natives, and have not spared purse, nor pains, nor hazards, (very many times,) that the whole land, English and natives, might sleep in peace securely. 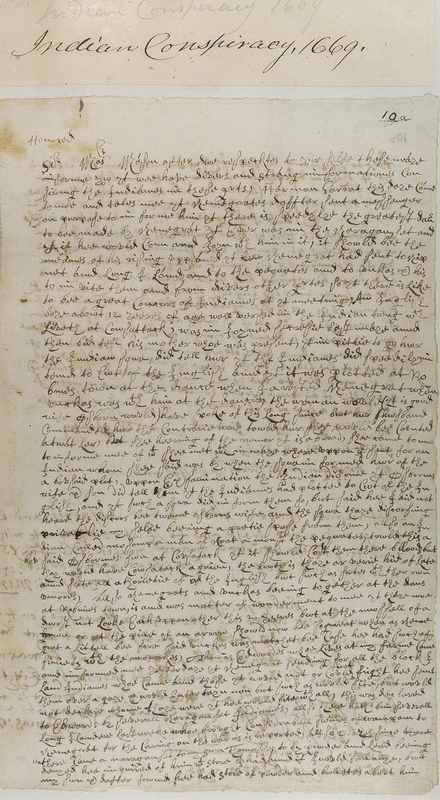 That in my last negotiations in England, with the Parliament, Council of State, and his Highness, 1. 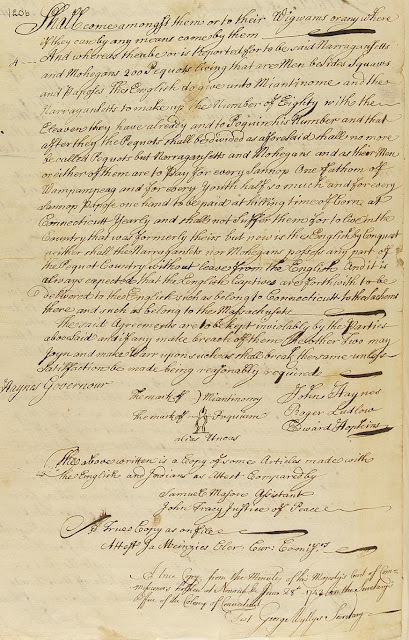 I have been forced to be known so much, that if I would be silent, I would not only betray mine own peace and yours, but also would be salie to their honorable and princely names, whose loves and affections, as well as their supreme authority are not a little concerned in the peace or war of this country. 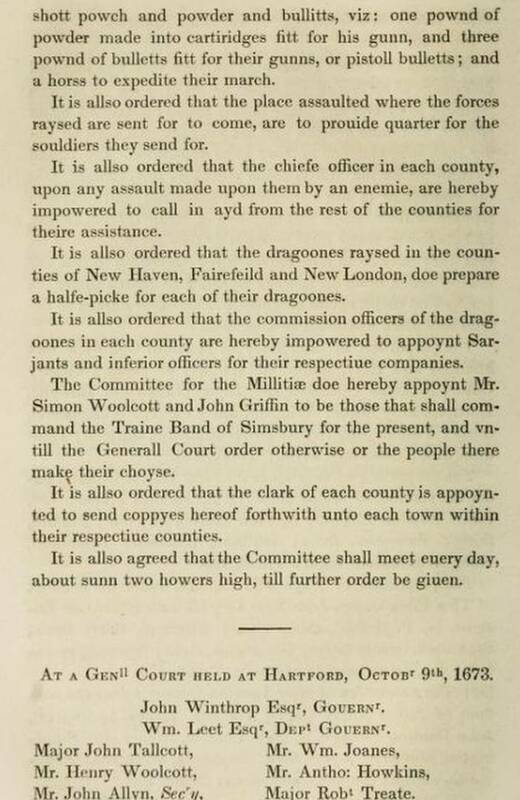 At my last departure for England, I was importuned by the Narragansett Sachems, and especially by Ninigret, to present their petition to the high Sachems of England, that they might not be forced from their religion, and, for not changing their religion, be invaded by war; for they said they were daily visited with threatenings by Indians that came from about the Massachusetts, that if they would not pray, they should be destroyed by war. With this their petition I acquainted, in private discourses, divers of the chief of our nation, and especially his Highness, who, in many discourses I had with him, never expressed the least tittle of displeasure, as hath been here reported, but in the midst of disputes, ever expressed a high spirit of love and gentleness, and was often pleased to please himself with very many questions, and my answers, about the Indian affairs of this country; and, after all hearing of yourself and us, it hath pleafed his Highness and his Council to grant, amongst other favors to this colony, some exprestly concerning the very Indians, the native inhabitants of this jurisdiction. I, therefore, humbly offer to your prudent and impartial view, first these two considerable terms, it pleased the Lord to use to all that profess his name (Rom. 12: 18,) if it be possible, and all men. I never was against the righteous use of the civil sword of men or nations, but yet since all men of conscience or prudence ply to windward, to maintain their wars to be defensive, (as did both King and Scotch, and English and Irish too, in the late wars,) I humbly pray your consideration, whether it be not only possible, but very easy, to live and die in peace with all the natives of this country. For, secondly, are not all the English of this land, generally, a persecuted people from their native soil and hath not the God of peace and Father of mercies made these natives more friendly in this, than our native countrymen in our own land to us? Have they not entered leagues of love, and to this day continued peaceable commerce with us? Are not our families grown up in peace amongst them ? Upon which I humbly afk, how it can suit with Christian ingenuity to take hold of some seeming occasions for their destructions, which, though the heads be only aimed at, yet, all experience tells us, falls on the body and the innocent. 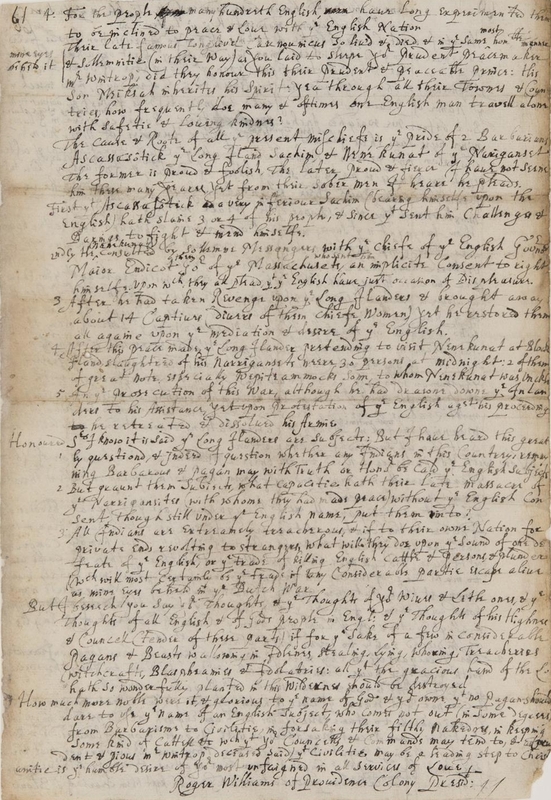 Thirdly, I pray it may be remembered how greatly the name of God is concerned in this affair, for it cannot be hid, how all England and other nations ring with the glorious conversion of the Indians of New England. You know how many books are dispersed throughout the nation, of the subject, (in some of them the Narragansett chief Sachems are publicly branded, for refusing to pray and be converted ;) have all the pulpits in England been commanded to found of this glorious work, (I speak not ironically, but only mention what all the printed books mention,) and that by the highest command and authority of Parliament, and churchwardens went from house to house, to gather supplies for this work. Honored Sirs, Whether I have been and am a friend to the natives' turning to civility and Christianity, and whether I have been instrumental, and desire so to be, according to my light, I will not trouble you with ; only I beseech you consider, how the name of the mod holy and jealous God may be preserved between the clashings of these two, viz. : the glorious conversion of the Indians in New England, and the unnecessary wars and cruel destructions of the Indians in New England. Fourthly, I beseech you forget not, that although we are apt to play with this plague of war more than with the other two, famine and pestilence, yet I beseech you consider how the present events of all wars that ever have been in the world, have been wonderful fickle, and the future calamities and revolutions, wonderful in the latter end. 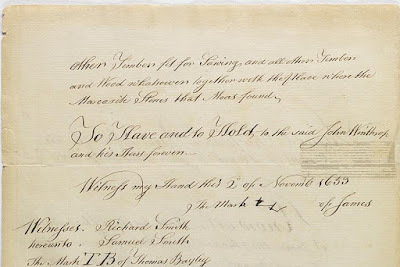 How frequently is that saying in England, that both Scotch and English had better have borne loans, ship money, &c, than run upon such rocks, that even success and victory have proved, and are yet like to prove. Yea, this late war with Holland, however begun with zeal against God's enemies, as fome in Parliament said, yet what fruits brought it forth, but the breach of the Parliament, the enraging of the nation by taxes, the ruin of thousands who depended on manufactures and merchandise, the loss of many thousand seamen, and others, many of whom many worlds are not worthy ? But, lastly, if any be yet zealous of kindling this fire for God, &c, I beseech that gentleman, whoever he be, to lay himself in the opposite scale, with one of the fairer. buds that ever the fun of righteousness cherished, Josiah, that zealous and melting-hearted reformer, who would to war, and against warnings, and fell in more untimely death and lamentations, and now stands, a pillar of salt to all succeeding generations. First, that the Narragansetts and Mohawks are the two great bodies of Indians in this country, and they are confederates, and long have been, and they both yet are friendly and peaceable to the English. I do humbly conceive, that if ever God calls us to a just war with either of them he calls us to make sure of the one to a friend. It is true some distaste was lately here amongst them, but they parted friends, and some of the Narragansetts went home with them, and I fear that both these and the Long Islanders and Mohegans, and all the natives of the land, may, upon a found of the defeat of the English, be induced easily to join each with other against us. 2. The Narragansetts, as they were the first, so they have been long confederates with you ; they have been true, in all the Pequot wars, to you. They occasioned the Mohegans to come in, too, and so occasioned the Pequots' downfall. 3. 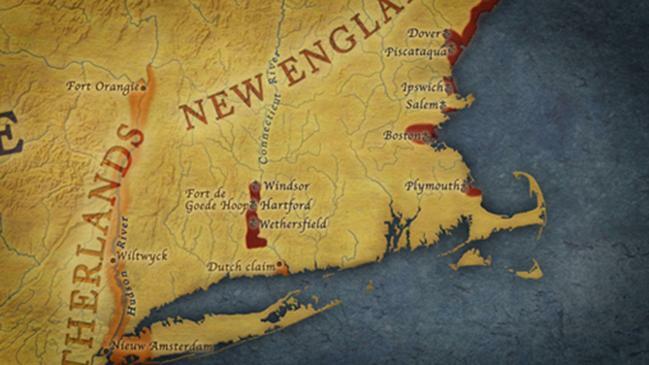 I cannot yet learn, that ever it pleased the Lord, to permit the Narragansetts to stain their hands with any English blood, neither in open hostilities nor secret murders, as both Pequots and Long Islanders did, and Mohegans also, in the Pequot wars. 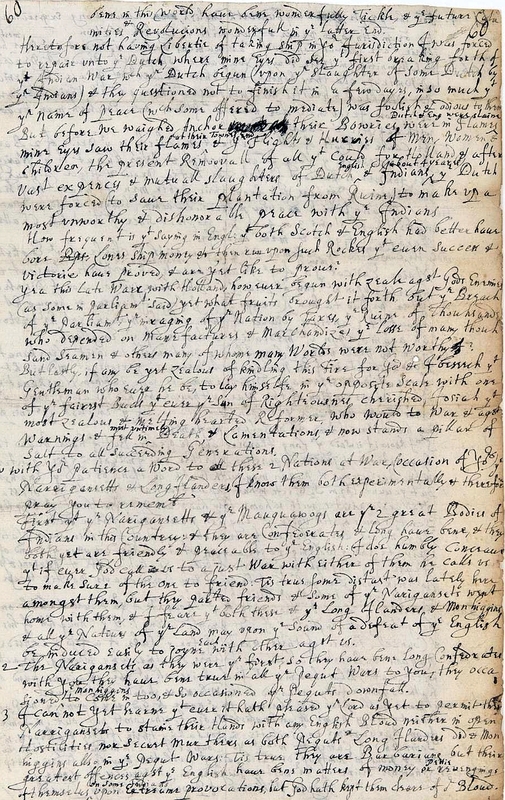 It is true, they are barbarians, but their greatest offences against the English have been matters of money, or petty revenging of themselves on some Indians, upon extreme provocations, but God kept them clear of our blood. 4. 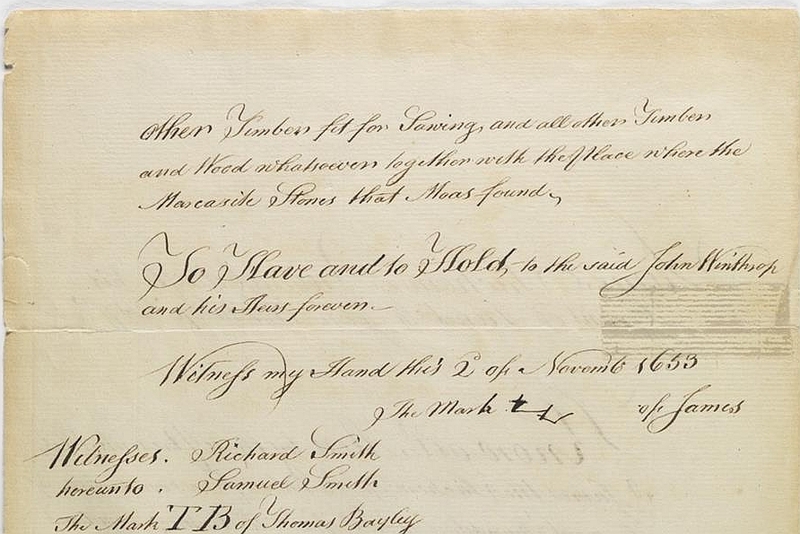 For the people, many hundred English have experimented them to be inclined to peace and love with the English nation. 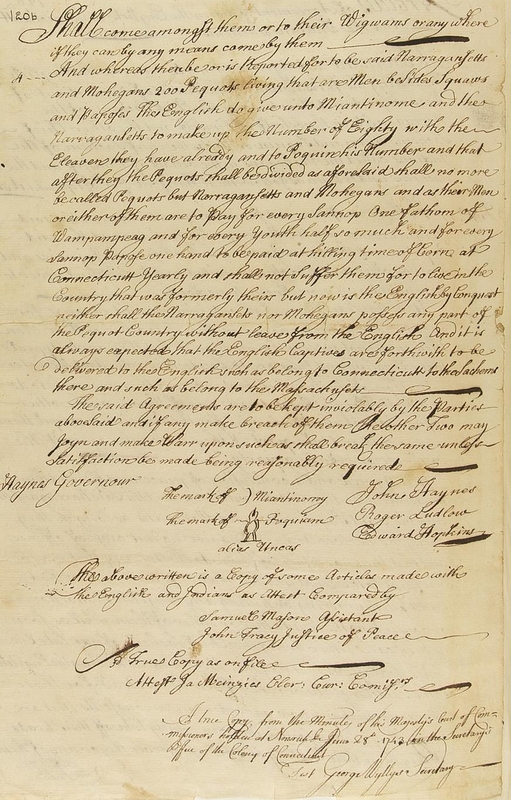 Their late famous long-lived Canonicus so lived and died, and in the fame moft honorable manner and solemnity (in their way) as you laid to sleep your prudent peacemaker, Mr. Winthrop, did they honor this, their prudent and peaceable prince. His son, Mexham, inherits his spirit. Yea, through all their towns and countries, how frequently do many, and oft-times one Englishman, travel alone with safety and loving kindness! First, that AicalfalTotic, a very inferior Sachem, bearing himself upon the English, hath slain three or four of his people, and since that, sent him challenges and darings to right, and mend himself. 2. 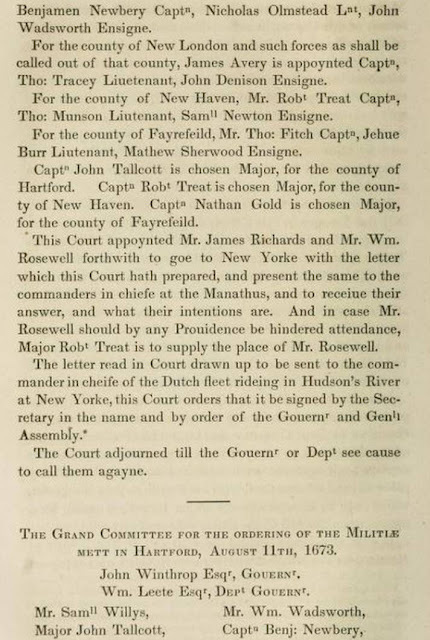 He, Ninigret, consulted, by solemn messengers, with the chief of the English Governors, Major Endicott, then Governor of the Massachusetts, who sent him an implicit consent to right himself, upon which they all plead that the English have just occasion of displeasure. 3. After he had taken revenge upon the Long Iilanders, and brought away about fourteen captives, divers of their chief women, yet he reftored them all again, upon the mediation and defire of the Englifh. 4. 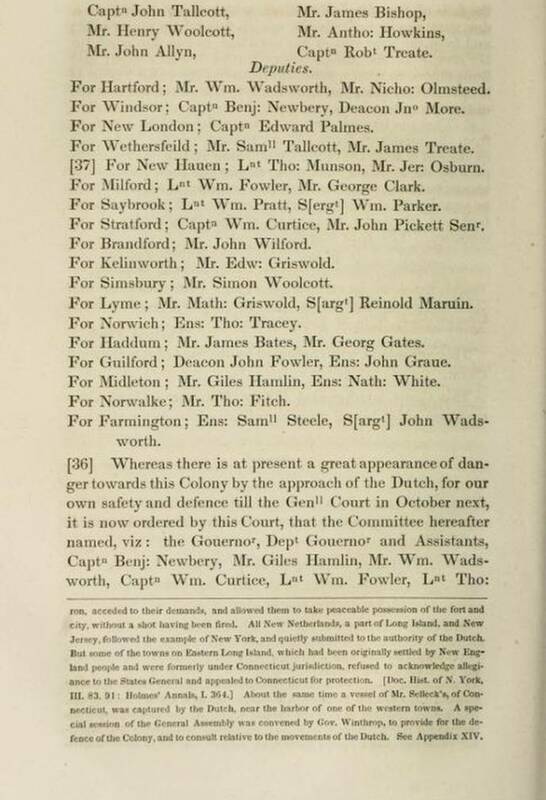 After this peace made, the Long Islanders pretending to unifit Ninigret, at Block Island, slaughtered of his Narragansetts near thirty persons, at midnight, two of them of great note, especially Wepiteammoc's son, to whom Ninigret was uncle. 5. In the prosecution of this war, although he had drawn down the Islanders to his assistance, yet, upon protestation of the English against. his proceedings, he retreated and dissolved his army. 2. But grant them subjects, what capacity hath their late massacre of the Narragansetts, with whom they had made peace, without the English content, though still under the English name, put them into? 3. All Indians are extremely treacherous; and if to their own nation, for private ends, revolting to strangers, what will they do upon the found of one defeat of the English, or the trade of killing English cattle, and persons, and plunder, which will, most certainly be the trade, if any considerable party escape alive, as mine eyes beheld in the Dutch war. But I beseech you, say your thoughts and the thoughts of your wives and little ones, and the thoughts of all English, and of God's people in England, and the thoughts of his Highness and Council, (tender of these parts,) if, for the fake of a few inconsiderable pagans, and beasts, wallowing in idleness, stealing, lying, whoring, treacherous witchcrafts, blasphemies, and idolatries, all that the gracious hand of the Lord hath so wonderfully planted in the wilderness, would be destroyed. 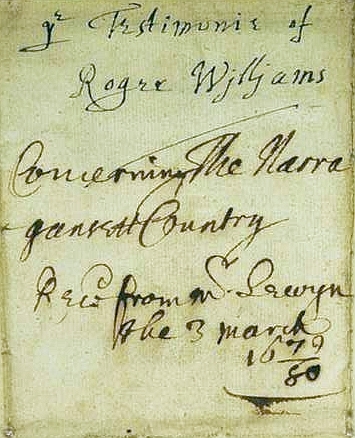 Roger Williams, of Providence colony, President.